A few weeks ago, I posted about my first visit to Oak Point Park and Nature Preserve in Plano. At the time of my visit, I was unaware that there is a small remnant of blackland prairie within the preserve that is threatened because the city is planning an annual two-day music festival in the area. I found out about the prairie remnant the day I was preparing the post and included links to a couple of news stories. 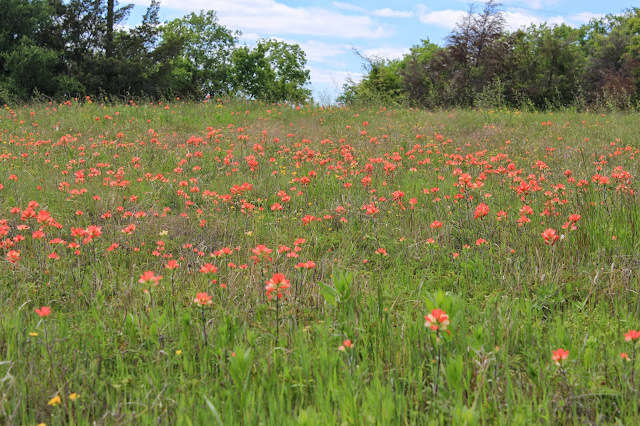 After I published my post on Oak Point, I received a couple of comments from Carol Clark, the president of the Collin County Chapter of the Native Plant Society of Texas. Carol was kind enough to offer to show me around the prairie. It was an offer I could not refuse, so I met Carol and her husband, Richard, at the fire station on Los Rios Boulevard for a two hour guided tour of the prairie on November 2. After the tour, Carol and Richard left to go about their Saturday and I walked around on my own for another hour or so. This little piece of prairie in the Oakpoint Park was largely unknown native plant enthusiasts until the last year. Los Rios Blvd runs along the opposite side of the fence above and it is a little difficult to see the prairie from the street. When I visited the park for the first time in September, I drove down Los Rios and thought I saw some wildflowers blooming. I was tempted to stop, but I did not see a paved area to pull over and I was not sure if this was part of the park or private property. I wish I had pulled over because the flowers I thought I saw were probably Liatris and the field was full of them. This prairie remnant was formerly used for farming, however, many native plants returned over the years. The dominant grass in this prairie is King Ranch Bluestem, an invasive introduction from Europe. I did see a couple of clumps of the native Sideoats Grama, Bouteloua curtipendula, and another grass that I believe was Splitbeard Bluestem, Andropogon ternarius. I should have asked Carol because she could rattle off the common and botanical names of the plants we saw just as well as her own name. That is part of Carol in the picture above. I think she is looking for one of the many birds that flew out of the grass as we walked through. Here is a shot of some of the Liatris seedheads glowing in the morning sun. This must have been quite a sight when they were in bloom. Carol says there were many monarchs flying around when the flowers were blooming. Here is a closer look at the Liatris. I was also interested in the rounded seedheads in the foreground. The rounded seedheads belong to False Boneset, Brickellia eupatoroides. I looked up this plant and the flowers look like a white mistflower. This is probably a good butterfly plant when in bloom. Looking at the ground, there are signs of next year's wildflowers everywhere. I also saw a few of these large fungi growing on the ground. This one was about the size of a softball. This is one of the areas that are scheduled to be used for the music festival. There is not much here from a native plant perspective, but I believe it is very near here that Carol saw painted buntings nesting earlier this year. It is nice to see rolling hills of grass and wildflowers in Plano. This is a rare sight. Off in the distance is the lake that I walked around for my first visit to the park. I stopped under the trees to the left of the lake and looked off in this direction, but did not realize that this prairie area was here. There were some autumn colors in this old fence row. The reddish plant is Aromatic Sumac, Rhus aromatica, and the yellowish plant is Elbow Bush, Forestiera pubescens. This is one of several plants that Carol needed to identify for me. It is Soft Goldenasters, Chrysopsis pilosa. The sprays of tiny yellow flowers are Prairie Broomweed, Amphiachyris dracunculoides. This was probably the most obvious flower blooming at the time. Moving up the hill, you can see what could have happened to this entire area if it were not for the efforts of people like Carol. The city scrapped of the wild vegetation and planted some kind of rye or fescue grass. What a contrast. On one side, a beautiful, vibrant prairie where 200 species of native plants have been identified. On the other side, a monoculture of non-native lawn. Doesn't Plano have enough lawns already? To make matters worse, several of the cedar trees were trimmed into an unnatural shape of a Q-tip. There are signs of human activity all around the prairie. I do not know all of the details of the city's plans, but I do know that the city has been cooperative and Carol is optimistic that much of the prairie habitat will be preserved. There are plans to put a split rail fence around the prairie along with interpretive signs. But there is still a section of the prairie that is in danger. There are also concerns that efforts to "improve" the area for concerts (irrigation, insecticide spraying, etc.) will harm the natural balance in this area. The tour continued across Los Rios Blvd to another section of Oak Point. Because it was late in the season, you often had to look closely to find flowers blooming. A woman on a horse approached us and asked what we were looking for. She said she first thought we were bird watching, but noticed we kept looking at the ground. We were bird watching, but we were also plant watching. The woman lives across the nearby creek in Parker and rides her horse in the equestrian area at Oak Point. This small pink flower is Small Palafox, Palafoxia callosa. This Smooth Sumac, Rhus glabra, was striking. Update: Carol says this may be a Chinese Pistache, an invasive species. That may be the reason there were no suckers around the tree. When I identified the tree, I was not thinking about invasive plants, but foreign species are crowding out the natives in natural habitats across Texas. If this is a Chinese Pistache, it is not so pretty after all. Here is a closer look at the flaming leaves. Sumac or Chinese Pistache? Mealycup Sage, Salvia farinacea, grew around this cactus and more Prairie Broomweed is in the background. One of the most interesting plants we saw were Spiranthes orchids. I never knew that there were any orchids that grew wild in Plano. We saw about 5 of them in one area. I did not get a very good picture of the orchids, so Carol emailed one that I could use. The picture above is courtesy of Carol and used with her permission. I went back a couple of weeks ago and found more orchids in a different area. I got some better pictures this time and will share them in another post. It was a cool morning and I found this butterfly warming its wings on some moss. I collected several flower seeds on this day, but I skipped picking any persimmon seeds. Apparently, coyotes like persimmons and they deposited the only seeds I saw. Arkansas Yucca, Yucca arkansana, is quite common on both sides of Los Rios Blvd. More Prairie Broomweed surrounds the yucca and small Smooth Sumac plants are in the background. These last three pictures are some that Carol took earlier in the year when the spring wildflowers were blooming. I can't wait to go back in the spring to see this display. Hopefully, the prairie will be protected and these scenes can be enjoyed for many, many years to come. If you would like to show your support for the prairie at Oak Point Park and Nature Preserve in Plano, please send a nice email of support to any or all of the following officials with the City of Plano, Amy Fortenberry: amyf@plano.gov, Ron Smith: rons@plano.gov, and Robin Reeves: robinr@plano.gov. Coming up in Save the Prairie at Oak Point - Part 2, I returned to the prairie on November 16 for a self-guided walk around the prairie. There were some amazing fall colors on this visit. This morning I stepped onto the patio for a deep breath of life before leaving for work. It was an absolutely beautiful morning. As I stood there soaking it in, I realized that this is all about to come to an abrupt end because an Arctic cold front will blow through on Tuesday. Temperatures that were in the low 70s today are expected to fall into the mid 20s by Wednesday morning. This will be our earliest freeze in 13 years and the season finale for the garden. Since it will all be mush in a couple of days, I took a few quick pictures to capture the moment. So here are some pictures from this morning and a few others from the weekend. The Fragrant Mistflower just started blooming in the last week and now their long awaited blooming will be cut short. This is Blue Mistflower, Chromolaena odorata. It is the very last flower to begin blooming in my garden each year. Last year, it was blooming into December and was always covered in butterflies. I will cover the plant tomorrow in hopes of pulling it through the freeze. There is a little fall color in the garden. This is American Beautyberry. The flowers are Autumn Sage. The leaves of the Toothache Tree are beginning to turn yellow. This was my new pet, Wilbur. He wandered into the backyard Sunday afternoon. He was either brave or sick because he did not move much. I thought he was kind of cute for a rat. He is now making fertilizer for my garden. Thanks, Wilbur. It was interesting to see you, but I hope your friends and family don't come calling for a visit.